What do you do when the various levels of government, which are required by law to protect the environment and its wild species, does nothing? Or, worse yet, if the government actively tries to damage the environment? The environment is what keeps us all alive, yet the federal government, and many other levels of government in America, seem dedicated to demolishing our life support system. The EPA is the Environmental Protection Agency and one of its jobs is to protect endangered species. Its previous director, Scott Pruitt from my home state of Oklahoma, decided that the EPA had nothing whatsoever to do with environmental protection, and that its purpose was to provide him with a secret telephone and luxury travel. Now he’s back in Oklahoma trying to figure out ways to waste Oklahoma taxpayer money as badly as he wasted federal taxpayer money. So, what do we do? Just give up? It feels like it sometimes. But, fortunately, there are some large groups of people who really do care about the future and prosperity of humans and nature. One of those is the Cherokee Nation. Just recently, the Cherokee Nation of Oklahoma set aside a portion of the tribe’s park on Sallisaw Creek as a mitigation and protection area for the endangered American burying beetle. The Fish and Wildlife Service (FWS) is supposed to do this but meets resistance from the Trump Administration and from Congress. 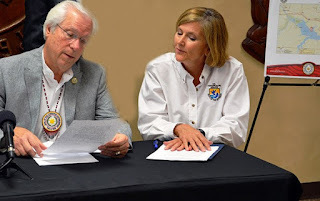 Instead, all that the Southwest Regional Director of the FWS could do was to happily look on as the Cherokee tribe stepped up to fill in the gap. "Cherokee Nation Principal Chief Bill John Baker reads an executive order designating a portion of the tribe’s 800-acre park on Sallisaw Creek in Sequoyah County as an American Burying Beetle Conservation and Mitigation Area for the next 10 years as U.S. Fish and Wildlife Service Southwest Regional Director Amy Lueders looks on." See the article here from the Cherokee tribal website.